What’s the deal with Dengue Fever? If you live in Florida, don’t ignore. Summer Science explained is a new blog series on Layman’s Terms Media. Each week, phenomena that are unique to summer time will be broken down and explained. I am currently taking suggestions for topics, so if there is something you’ve always wondered about feel free to contact me and pitch an idea! As a Floridian I have somewhat become immune to the feel of a mosquito bite. The annoying quick itch sensation is quickly thwarted by the thoughtless reflex of my hand slapping the affected area and then quickly scratching up and down for a few seconds. After that, I pretty much forget about the bite. When going on my evening runs, I usually plan to wear bug spray and then realize I have none. I really haven’t ever bought any. As far as I can remember, I only wear it if someone who has it offers it to me. This person is usually not from Florida and probably read/heard about our horrible mosquito problem prior to residing. But, after scanning the news headlines the last few days and seeing the words “Dengue fever” populating the “most read” sections, I may have to make a run to the store and buy a bottle of repellent. Turns out, areas populated by these pesky insects have more to worry about than bug bites and West Nile virus. Just last week there were seven cases of dengue fever outbreak in Martin and St. Lucie counties and one in Miami-Dade County. In the 1930s dengue loved to lurk around and infect people in the Sunshine State, but because of high-tech inventions such as AC and window screens the problem was somewhat eradicated. But, in 2009 the virus decided it wanted to go on vacation again, and chose at least 28 people in Key West to be its rgracious “hosts.” In 2010, it made it’s way from various mosquitoes to about 66 more people on the small island. The virus took a brief vacation, but has decided once again to wreak havoc, this time in Central Florida with the latest outbreak mentioned above. Although dengue can potentially be fatal, most people experience flu-like symptoms such as fever, headache, eye pain, pain of the muscles and joints (which is why it has the nickname breakbone fever) and sometimes vomiting and diarrhea. Ok so we know what dengue causes. . . but what is it? Dengue is an infectious disease typically transported by mosquitoes, specifically the Aedes aegypti and Aedes albopictus species which are both common in Florida. Dengue fever virus is a single-stranded RNA virus that belongs to the family Flaviviridae, and is kin to other well-known viruses such as Yellow Fever and West Nile Virus. All of the viruses in the flaviviridae use arthropods such as ticks and mosquitoes as their main vector, or form of transportation. The virus has four known strains or serotypes (DENV-1, DENV-2, DENV-3 and DENV-4). 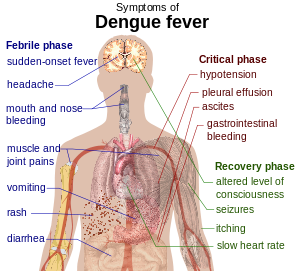 A person who contracts one strain, and then later a different strain has a higher potential for the disease to be fatal. It only takes one bite–by a female mosquito– to get infected, so if you’re like me and barely pay attention to bites, you may want to pay a little more attention in case you become ill. It takes anywhere from 3 to 14 days after the bite for symptoms to show. 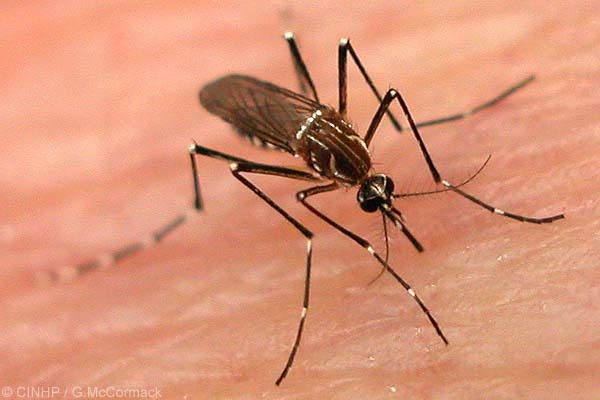 Once the infected mosquito bites its prey, the virus and saliva from the bite partner up to enter into the host’s white blood cells, multiplying while it moves through the body. The white blood cells then panic and produce signaling proteins to warn the body. Unfortunately these signaling proteins are responsible for most of the symptoms. But, about 80 percent of those who unwittingly are chosen to be hosts for the virus are either asymptomatic or express only a mild fever. For this reason, dengue can easily be mistaken for the flu, but a blood test can easily confirm whether you have the virus. Currently, there is no licensed vaccine or treatment for dengue except for staying well-rested and drinking tons of fluids to stay hydrated to ease the symptoms. What’s the scope of the problem? If you’re reading this and think. . . 9 people out of the millions of people in the state? I get you, but a paper that appeared in Nature in April suggests that scientists are underestimating the scope of the problem worldwide. The study says that there could be about 400 million cases annually around the globe (four times the estimate by the World Health Organization), which would make it even more prevalent than malaria. The authors of the study suggest that even though the disease has often been referred to as a tropical disease, it has been spreading to places outside the tropics such as Portugal and Russia. One of the theories related to the unlikely spread of this disease to cooler places is climate change. Scientists say that global warming can potentially increase the spread of many infectious diseases, most of which thrive in warmer temperatures. But, the authors also say that many of the infections go unreported, especially in overpopulated developing countries which can be prime breeding spots for mosquitoes and the virus. These countries are also more at risk because since the disease is highly infectious, it could possibly overwhelm already-strained healthcare systems. But…don’t freak out. There are plenty of things you can do to prevent an immune system intruder. Check out these tips from the Department of Health. You can also check the real-time status of a disease outbreak in Florida here. Also, since scientists are equally intrigued with this problem, there are tons of initiatives underway around the world to once again eradicate the unwelcome disease, see below! Can Genetically Modified Bugs Reduce Dengue Threat?